Land Rover Australia is pleased to announce that the new 2015 Range Rover Sport SVR will be priced at $218,500 (excluding all on road costs). The Range Rover Sport SVR is the fastest, most powerful and most dynamically focused Land Rover ever produced. On sale in Australia from Quarter 2 2015. "THE fastest, most agile, most responsive LAND Rover ever"
All-New Range Rover Sport Revealed "THE fastest, most agile, most responsive LAND Rover ever"
The Stormer Kit introduces a bolder, more aggressive, personalised look for the Range Rover Sport, and it is now available in Australia on 09MY vehicles. Continued enhancement and refinement best describes the changes for the Range Rover Sport 09MY. These include a refreshed exterior trim, new wheel designs and improvements to the interior craftsmanship enhancing the premium feel. 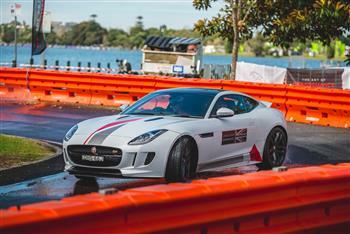 The F-TYPE Supersprint and Jaguar Ice Cube will highlight the performance and handling capabilities of Jaguar's cars at Melbourne's Albert Park circuit while giving car lovers a chance to experience it first-hand.